Photofiltre is a professional looking image retouching program. It comes with the usual set of photo editing tools but the real strength of the software program lies in its image filtering and image manipulation filters. The user can choose from a selection of more than 100 photo filters like reviving colors, adding a night effect or making it look like it was drawn with a black pencil. Another interesting feature that is selectable is the Photo Mask feature. It basically makes use of preset masks which are nothing more than grayscale images with white being the opacity color while the different shades of gray increase the opacity. A set of photo masks is available and custom ones can be created easily. 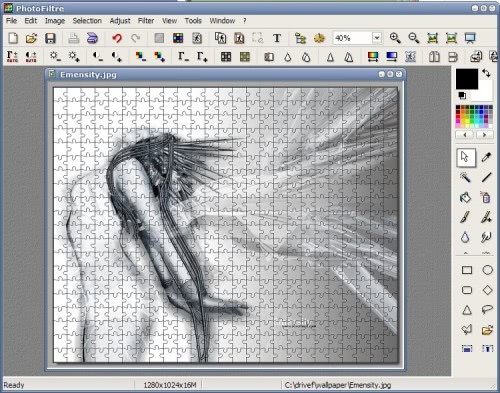 Photofiltre can be expanded with so called plugins which add new features to the application. This ranges from red eye removal to removing dead pixels or curling images. Photofiltre is most likely not the tool that users who own Adobe Photoshop would use but it is quite suitable for anyone who wants to manipulate images by adding filters to them. regarding your last comment, Martin – i do own an older version of Photoshop, and while it’s far superior to Photofiltre in many ways, i still use this app quite often. why? it’s FAST. it starts up in no time, and it’s much better for a quick crop or resize or some other little thing. i still use Photoshop for extensive edits, but enjoy Photofiltre for quick jobs. Great application. Thanks for bringing it to my attention. One negative thing about it I found so far is that the application does not save images as a JPEG such that source appears accurately represented (an example would be dark blue text of one pixel line thickness saves as black text with one pixel line thickness with a blue glow affect). Other formats seem to save satisfactory.